Divorce cases involve civil law. No jail time or criminal penalties are involved like in criminal law cases. Parties seeking divorces may have to give depositions, meaning they answer questions in the presence of a court reporter at a lawyer's office. 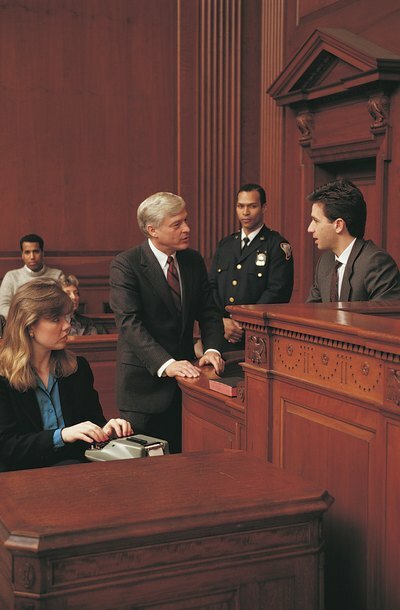 A person may have to answer interrogatories, which are written questions submitted by the other side's attorney. A person may also have to testify in court at a divorce trial. So long as requests are relevant to the divorce proceedings, the law requires the exchange of information between the parties. In some states, adultery may be a legally relevant factor in a divorce proceeding. For example, a divorcing spouse may seek reimbursement for marital money his spouse spent supporting an adulterous affair. Some prenuptial agreements use adultery as a way of reducing a cheating spouse's share of marital assets in a divorce. These are some common reasons why questions about adultery are asked in divorce cases. In most states, the Fifth Amendment does not stop a court from forcing a cheating party to answer questions about her infidelity. Some states still have old statutes on their books that criminalize adulterous affairs. Laws that are meant to control personal, sexual behavior are known as moral statutes. In modern times, moral statutes have been repealed in most jurisdictions. The idea is that police should not monitor personal behavior between consenting adults. However, even if a law is archaic and rarely, if ever, enforced, its mere existence can raise Fifth Amendment issues in divorce cases. If there is even a remote possibility that a confession of adultery could lead to criminal prosecution, a party may refuse to answer about it. A divorce court cannot overrule the constitutional protection against self-incrimination in divorce cases where adultery is a state crime. However, some divorce courts may assess civil fines against a person for not answering. A state judge may also presume adultery by a person's silence and divide marital assets more favorably to the other spouse. The idea behind the Fifth Amendment is to avoid criminal prosecution. It is not to create a loophole of silence for cheating spouses in divorce cases.